I'm one of those people that love beets! Although, truthfully, I didn't know it until this summer! When I was little, every Christmas at my Great-Grandma's house pickled beets were always included in the spread. I hated them then but somehow this year I decided I now liked them! I honestly can't even remember trying them again to come to this conclusion, but I like 'em! This year we planted some beets in Mom and Dad's garden just for the purpose of pickling them this fall. Also, this summer, I realized I like roasted beets. On a whim I tried them on the Whole Foods hot bar. I knew my garden crop would be put to good use! So good! First, wash and trim your beets. Cut the green tops off (but save 'em!) and the bottom root tip. Wrap them all in aluminum foil and pop into a 400-450 degree oven. 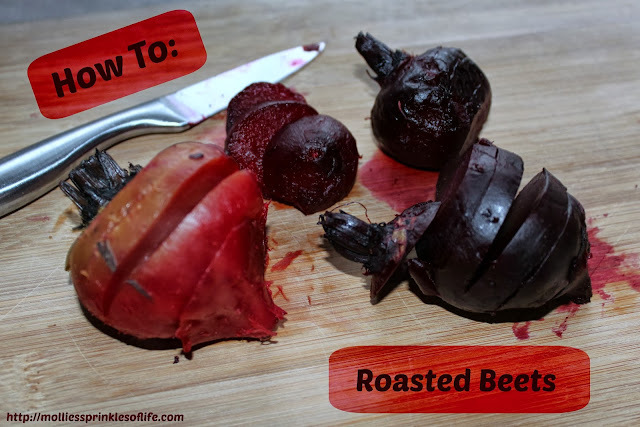 Depending on the size of your beets, they could take up to 90 minutes to roast, usually about 50-60. I like to cut bigger ones into halves or quarters so they all cook at the same rate. When you can easily prick with a fork, they're done! When cool, unwrap and peel the skin off with either your foil (less waste ;) ) or paper towels. Once roasted, the skin will easily peel off. Roasted beets come with many possibilities! Even plain and naked, they are delicious! And so good for you! Beets are high in folate, fiber, vitamin C, and potassium! Get some beets in your diet, everybody! Plus, who can deny how beautiful they are?!? And don't forget to save those greens you cut off. They are excellent sauteed in a pan with a little olive oil, salt and pepper. And they're super nutritious! Beets greens are one of the most nutrient packed dark, leafy green you can choose! 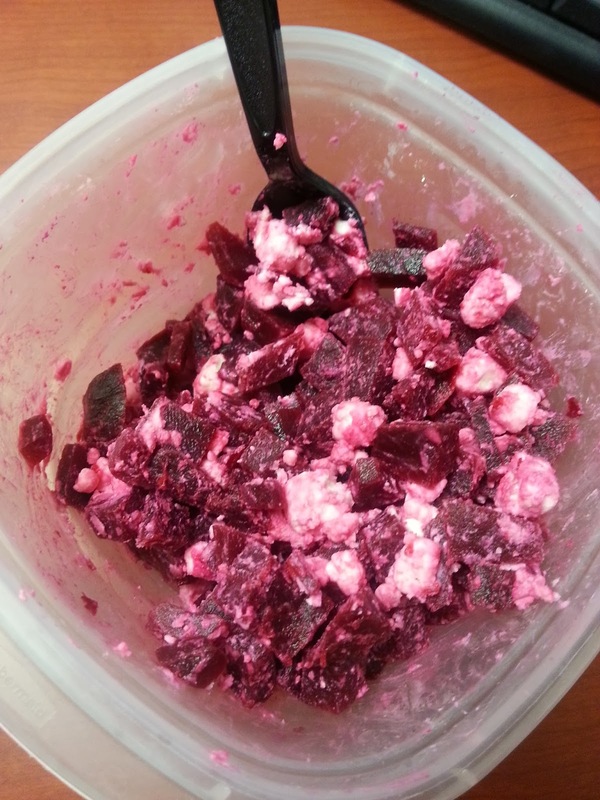 My favorite way to enjoy my beets, though, is roasted, cubed and mixed with goat cheese. I first learned of this combo just this summer, too. When I was in D.C. for work this past August, this dish was part of lunch served at the Hilton. I was hooked and knew I had to recreate at home. And have been again and again and again all summer! Stay tuned, though, because coming soon I will be showing you a quick and easy how-to on pickling your beets! Do you like beets? What's your favorite way to prepare them?